Listen to "Origins: Fourteen Billion Years of Cosmic Evolution" on your iOS and Android device. 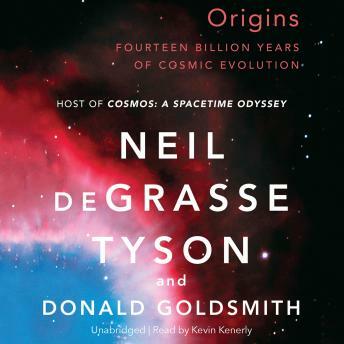 Origins: Fourteen Billion Years of Cosmic Evolution authored by Neil DE Grasse Tyson and Donald Gold Smith underscores their deep passion for astronomy and science as a discipline. I was not aware of how much I really enjoyed astronomy until I took a college level astronomy class. Often I wondered about how life began, and the existence of life in other worlds. Tyson authored more than a dozen non-fiction books, and two of his books “ The Pluto Files: The Rise and Fall of America’s Favorite Planet” and “The Sky Is Not The Limit: Adventures of an Urban Astrophysicist” remain at the top of my favorite books list. Tyson used his masterful skills of engaging readers with insight to his genuine passion for astronomy in an intellectual, and interesting delivery. Readers need not be well versed in science disciplines, or specifically aspiring to be a astrophysicist to be able to comprehend and enjoy the vast amount of fascinating information Tyson reviews. In his other titles, Tyson charismatically demonstrates his knowledge of astrophysics by purposefully integrated humor in his concepts. Origins: Fourteen Billion Years of Cosmic Evolution is no different, as Tyson and Goldsmith team up to continue their ultimate goals of effectively spreading science literacy. Origins: Fourteen Billion Years of Cosmic Evolution brilliantly explains key concepts and processes so that the readers who are part of the scientific community, and layman public can make more informed decisions. Excellent book, well written - gets into complex ideas but us still written in a 'down to earth' style. I was astounded by the idea that we may be at a unique point in the universe's life cycle and it is this fact that allows life to exist. Since it has been proven that the universe is expanding at an ever increasing rate, hundreds of billions of years into the future we could not exist at all.